As a prepper, you know the importance of having the right gun ready to go when SHTF. In emergency situations, you might need to escape from your current location and reach your hideout, where you’ll have access to food, water, shelter, and security. To get past any enemies or bad guys you may encounter, you’ll need both outdoor skills and a good gun to ward off threats. This where the Ruger 10/22 comes in. Many people underestimate the 10/22 when it comes to survival guns. True, it does not have the fame of the AK47 or AR15, which are both legendary rifles. However, it is reliable, accurate, and portable and comes with an array of aftermarket parts. As Aaron mentioned before, .22 ammunition is widely available and is quite affordable. When a disaster strikes, it’ll be reassuring to know that your caliber will be common enough to buy or scavenge. Once you have secured a place to stay, you may need to hunt for survival, and the 10/22 will prove an asset in such a situation. The rifle is great for clearing out varmints, bagging small game like squirrels or rabbits, or even taking larger quarry like deer if you are a skilled shot. Using the .22 allows you to keep your larger caliber ammo such as 9mm, 12-gauge, etc. for more dangerous creatures. Because the .22 is quiet, poachers have effectively used it for decades. It’s light, easy to carry, and accurate. For hunting, you’ll find the 10/22 is more than a match for most rimfire rifles out there. 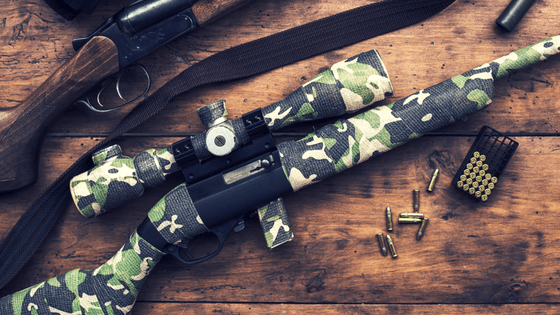 In addition to hunting, survival means taking care of threats posed by the bad guys, and the 10/22 is an effective deterrent when it comes to self-defense. The Takedown version of the 10/22 can be fit into a standard backpack by separating the two halves, making it discreet and portable. However, it is important to understand what happens after shooting someone in self-defense. As good as the 10/22 is at certain functions, such as hunting and getting rid of varmints, it is not ideal for defending yourself against well-armed and determined adversaries. The .22 bullet is not the best gun to kill an attacker with a single shot, unlike a semi-automatic with more stopping power. In scenarios where you expect confrontations with armed groups or militias, you’re better off with a heavier caliber gun. A semi-automatic rifle like the AR-15 is a much bigger deterrent for criminals and bad guys in an SHTF scenario. You can use the 10/22 for training and help with muscle memory, but keep in mind that practicing with a 10/22 does not prepare you for the larger recoil in the heavier calibers. The 10/22 can still be a decent deterrent in one-on-one confrontations. It’s still a deadly weapon when shot well. It’s not ideal, but it’s definitely a help. In a lot of SHTF situations, you’re going to be up against lone looters and the like, and the 10/22 is usually enough to keep them at bay. 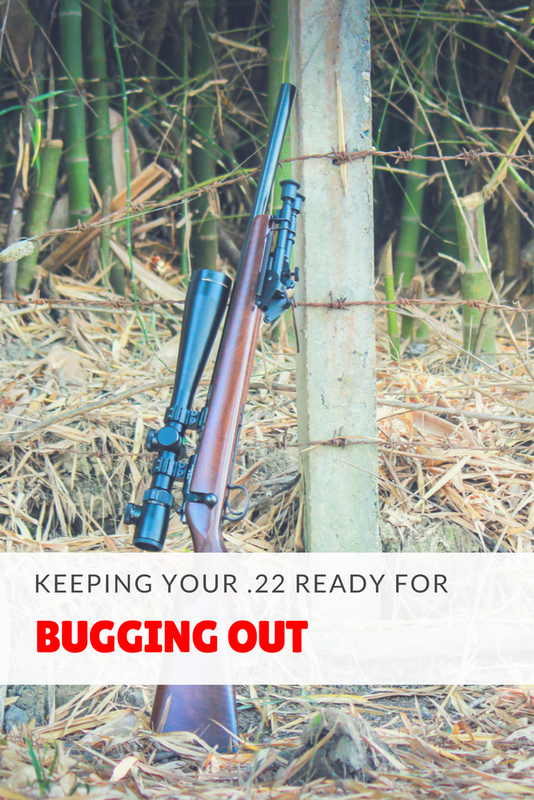 Getting your 10/22 ready for a bug out means it should be in perfect condition and suited to your precise needs. To customize the gun, there are a few almost-essential upgrades to take the 10/22 to a new level and turn it into a true survival aid. Most scope manufacturers make “rimfire” scopes that are parallax-corrected for 50 yards, versus 100-150 yards for high power rifle scopes, so start by selecting a rimfire scope. Considering the optimum shooting distance for a 22 LR is from 25 to 75 yards, the best match for a general-purpose scope would be a 2-7X. This would provide the optimum magnification for 20-70 yards and can easily be stretched to 100 yards. Having a sling is helpful for carrying your rifle. You’re going to have enough on your hands, with your backpack to carry and many other things to worry about. We recommend using a dual-point sling. It’s a lot more stable, and you can also learn to use it to provide more support while you’re shooting. A one-point sling can work also, but the gun tends to flop around a lot more. But you can always jury-rig it by wrapping part of it around the barrel so that it functions as a dual-point. When it’s a matter of survival, you need to have larger magazines than the stock 10-round rotary magazines offered by Ruger. 20-and 30-round magazines are available. It’s far easier to haul one 30-rounder than 3 10-rounders. It also helps to ease the use of your gun especially if you’re up against the wall trying to defend yourself and your family. A good external suppressor can make the 10/22 much quieter, giving you an advantage in both hunting and avoiding the notice of bad guys. The right suppressor will dampen the gunshot noise while leaving the accuracy of the rifle unaffected. When it comes to natural disasters like Hurricane Katrina, history has shown that having a gun to protect yourself and your family is a major advantage. You need to deter looters and thieves while also being able to live off the land once you reach your bug-out destination. Acquire plenty of ammo beforehand, so you are in no danger of running out when the SHTF. In order to survive, you’ll need to hone your shooting skills and become familiar with the handling of your rifle, so that’s the number one way to prepare. A custom 10/22 Takedown with the right accessories should stand you in good stead, but keep in mind that it’s not the best for self-defense against heavily-armed opponents. Josh Lewis is a lifelong gun fanatic and shares his thoughts on the best rifles and accessories on his website Gunmann.com.